Prominent & Leading Manufacturer from Jamnagar, we offer cpvc pipe 1/2" sdr 11, cpvc pipe 3/4" sdr 11, cpvc pipe 1" sdr 11, cpvc pipes 1.1/4" sdr 11, cpvc pipes 1.1/2 sdr 11 and cpvc pipe 2" sdr 11. We are offering a precision designed collection of 0.5 Inch UPVC Pipes SCH 11. The offered coupler is extensively appreciated by our clients for varied qualitative attributes like rugged design, durability and long operational life. Provided coupler is manufactured using factory-tested raw material and cutting-edge technology by our adroit personnel. Apart from this, offered coupler is stringently tested against a series of quality parameters to ensure its accurate dimensions. We are offering a wide range of 3/4" Inch UPVC Pipes SDR 11 that is manufactured using quality assured raw material and progressive technology. In tune with different demands of our valuable clients, we customize this pipe in various sizes and shapes. Widely used in automotive and heavy engineering industries, our offered pipe has gained exceptional value amongst our clients. Offered pipe is available with various specifications at industry leading prices. Our customers can buy from us a wide range of 1 Inch UPVC Pipes SCH 11. These pipes are fabricated in range of sizes, types and forms so as to meet diverse needs of varied industrial applications. To rule out every possibility of defect, we thoroughly inspect these pipes on certain well-defined parameters of quality. 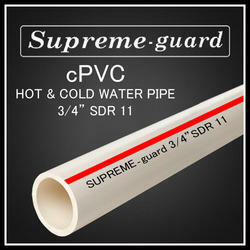 We bring forth a distinguished assortment of 1.25 Inch UPVC Pipes SCH 11 that is used in various industries. Our offered pipe is precisely manufactured using utmost-grade poly vinyl chloride and modish technology in tandem with defined quality standards. Tested against diverse quality parameters, this pipe has become the symbol of reliability that is widely used for water distribution systems. We are offering a wide range of 1.1/2" Inch UPVC Pipes SDR 11 that is manufactured using quality assured raw material and progressive technology. In tune with different demands of our valuable clients, we customize this pipe in various sizes and shapes. Widely used in automotive and heavy engineering industries, our offered pipe has gained exceptional value amongst our clients. Offered pipe is available with various specifications at industry leading prices. We are offering a wide range of 2" Inch UPVC Pipes SDR 11 that is manufactured using quality assured raw material and progressive technology. In tune with different demands of our valuable clients, we customize this pipe in various sizes and shapes. Widely used in automotive and heavy engineering industries, our offered pipe has gained exceptional value amongst our clients. Offered pipe is available with various specifications at industry leading prices.